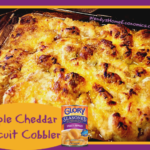 Home » Cooking ~ Recipes » apples, baking (she said in terror), pie please, product recipe development, sweet treats	» Who needs pie when you can have Apple Cheddar Biscuit Cobbler instead! Being that it’s “National Apple Pie Day,” (actually there are 2, and the other is in May! ), I dug around in my old recipes to see what sorts of apple things I had created over time. I do love the basics, but am an “outside-the-box” gal too. Wayyyy back several years ago, I had the opportunity to create some recipes for Glory Foods and demo them on stage at a show in Raleigh. I don’t remember if it was the Southern Women’s Show, or one of the Christmas shows… but it was one of those deals. Y’all know I prefer cooking “nekkid” foods… in the sense of just like God gave it to us, but I do have some products I find fun to use, work with and eat. Glory is one of them… I’ll have to dig back soon and share more of the recipes I did for them… although the pictures are horrific and were done way back before my becoming a food stylist and fine tuned my photography skills too. So when searching my files today for “apple pie” which I knew I had never done… up came this oldie goldie. 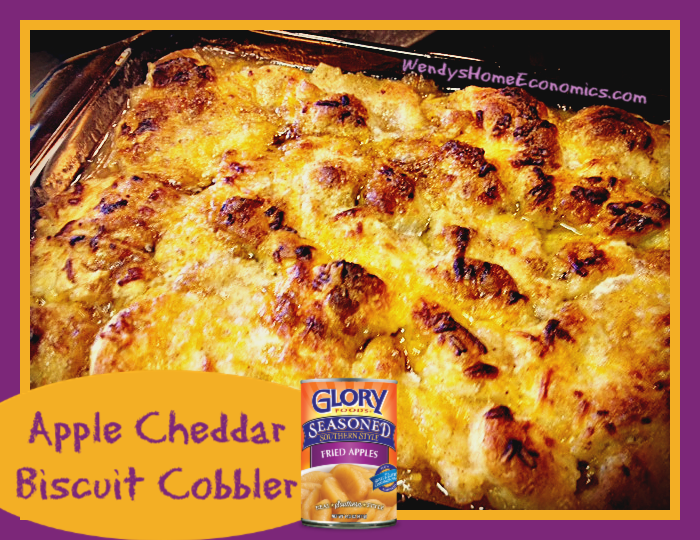 Pairing apple pie and cobblers with cheddar cheese may be foreign to some, but long ago, I was introduced to this luscious duo… with a piece of warm apple pie, topped with a slice of melting cheddar cheese! Oh MY Lord!!!!! The sweet and cinnamony apples with the salty cheesiness with the crust tucked in there was such a divine combination in my mouth! Who woulda thunk it? I got to taste this for the first time in a wine pairing class… lucked out and happened to have a chef in there who asked the instructor if he could bring foods each week to pair with the wines. Well of course the wine merchant said “YES” so the few of us in that class won the wine-tasting class lottery! The chef was there to learn how to pair his restaurant foods with appropriate wines. So on our final night, we paired some desserts and cheeses with wines. My most memorable pairings of weeks of that class were the port wine with stilton cheese (oh my LORD that’s good!)…. and the apple-cheddar pie with a really good Riesling. I will never forget those two divine marriages of food and wine. DO treat yourself sometime. So without further babbling… here you go! You can use any kind of canned “fried” apples. And you could probably use apple pie filling… although that might be too much sugar. But hey, who knows! Might be mo’better. Do make yourself some of this cobbler, and come to the post on my facebook community and tell us about it. When company drops by or for anytime you need a fast comforting dessert, this is it! You can throw this simple cobbler together in about 5 minutes, cook in about 25 and have hot on the table in just 30 minutes. Make ahead to throw in the oven and bake while eating supper so it’s all hot and cheesy just in time for dessert. Spray 8x8 baking dish. Stir vanilla extract and apple pie spice into drained apples, then pour into baking dish. Scatter with half the cheese and half the brown sugar. Stir in gently to loosely mix together being careful not to break up pieces of apples. Pull biscuits apart and tear into pieces, stretching and flattening with fingers. Tuck a few pieces down into cobbler and place others over top of apples. Scatter remaining cheese over biscuit pieces. Spoon slurry over top of biscuits and cheese. Dot with butter and finish by scattering with remaining brown sugar. Place in oven and bake about 20 minutes until hot and bubbly and biscuits have browned. Serve immediately. Whisk 2 tablespoons cornstarch whisked into reserved juice.